While I was in Davao City, Philippines this Spring, I was fortunate to meet a group of youth DNH trainers. Seven of these remarkable young people attended our consultation in Davao. I’ll admit that when they walked into the room, I was a bit nervous that the adults, who were a mix of academics, field staff and headquarters staff, wouldn’t take them seriously. But fortunately, I had underestimated my colleagues. They welcomed the youth trainers (ages 13 to 17) into the discussions, encouraged them and even asked for their advice! The youth trainers, in return, challenged the adults to consider children’s issues and shared their stories about how DNH had transformed thier lives. World Vision trained seventeen youths as trainers. The youth trainers have since trained over 400 of their peers in DNH! 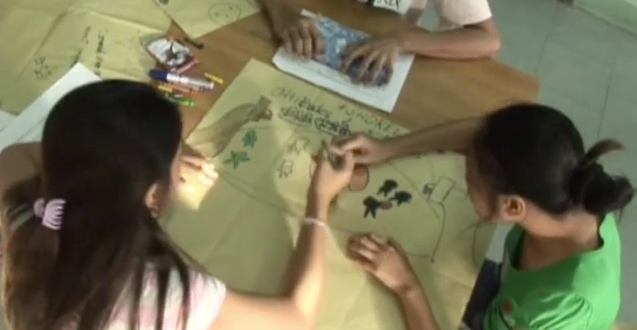 World Vision has released a video about them on YouTube, called Empowering Children as Peacebuilders.